Artists from across Fiji are saying bula to brushstrokes and trading their kava for carving tools in preparation for ART ON THE ISLAND V set to take place at the Sofitel Fiji Resort & Spa in October 2010. One of the biggest events on Fiji's cultural calendar, ART ON THE ISLAND V is a celebration of Fiji's artistic talent, presented by local arts charity CreatiVITI in association with Sofitel Luxury Hotels. A gala event to launch the eight-day exhibition at the Sofitel Fiji Resort & Spa will take place on Friday the 1st of October. Tickets to the gala launch are F$20 per person. The visual and heritage arts event, which includes craft markets, will be open for Sofitel guests and the public to enjoy until Saturday the 9th of October 2010. ART ON THE ISLAND V spokesperson and CreatiVITI Secretary Maria Rova says, "Our mission is to develop arts and crafts in Fiji through training, promotion and the enjoyment of creative expression in a setting accessible to the whole community. "Sofitel Fiji Resort & Spa has always been very supportive of the arts community in Fiji, and this upcoming exhibition a great way for us to further showcase Fiji's emerging art talent to the world." A celebrated artist in her own right, Maria Rova's work is on permanent display at the Sofitel. 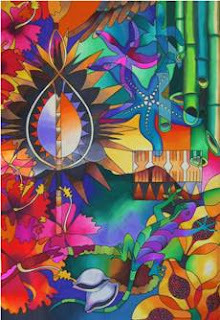 Other Fijian artists who will showcase their work at the hotel as part of the exhibition include local painter Joe Bilbu, and drawings by Lautoka artist Apimeleki Vakarau, a quadriplegic (victim of a rugby accident) and talented artist who draws while lying on a mattress on the floor, using ink pen on bark cloth. Previously commissioned by Sofitel to create artworks for display in guest rooms, Api's minute pen strokes reflect the very limited movement he has left in his arms and hands, making him an inspiration in person and on paper. General Manager Adam Laker says, "Maria Rova and Apimeleki Vakarau are two of many local artists featured on walls in public spaces and in guest rooms at the Sofitel. "Maria was one of the first artists we supported when we launched the resort in 2006, and indeed her colour and creativity is still one of the first things our guests see when they check in, with a huge Rova original on display directly behind our reception desk to greet visitors on arrival. "In addition we have many other local artists' work on display in each and every guest room at the hotel. For Sofitel it's a simple yet important way for us to support the local arts community and ensure that Fijian culture permeates the hotel and inspires our visitors each and every day." CreatiVITI is a membership-based organisation representing artists from across Fiji and home to Fiji's only pottery production studio, with showroom, mini-gallery and a crafts garden hosting demonstrations and classes. The organisation specialises in custom ceramic commissions and promoting local artists paintings, pottery, drawings, sculpture, handicrafts, pottery classes CreatiVITI also runs kids craft activities, , seasonal craft markets in addition to its annual art competition. As Denarau's most sophisticated international resort, the Sofitel blends traditional French influences that are the hallmark of the Sofitel Luxury Hotels brand with more exotic Fijian charms to offer a choice of modern facilities that extend to a Mandara Day Spa retreat, the world's first Pure Fiji concept store, the Turtle Club for kids, plus an impressive line up of award winning restaurants, bars and new sidewalk café Parisienne.